If '60s and '70s music is your bag, Retro could be the drum package for you! If you're not keen on Motown, you might not like it. Again, it's compact at 1.5GB, and as the title suggests, its emphasis is truly, well, retro! All three kits are Ludwig classics: a Black Oyster from the 60s, and a Blue Oyster and a Vistalite from the 70s. A few alternate drum sizes are included, so in total there are five kicks, four snares and a whole bunch of toms. Cymbals are mostly classic Paiste 2002s, with some Meinls and Sabians thrown in. Although each drum kit is available in 'clean' form, there are over 70 preset kits that use AD's onboard processing. 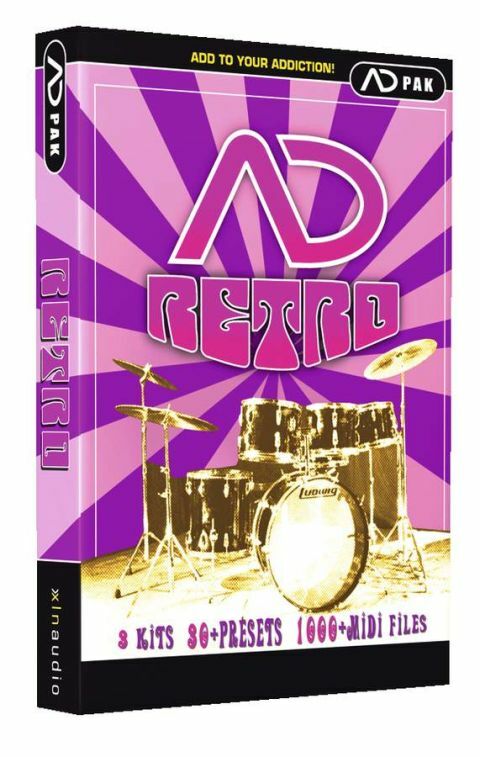 Retro also features in excess of 1300 vintage-flavoured MIDI beats and grooves, and these can be browsed from AD's main library. Kit sounds and beats range from Bonham to Ringo, with plenty of Motown, and with the Oyster kits sporting coated drumheads, character is the name of the game. The kit presets definitely help Retro to cover more ground, and we spotted some tasty 70s sounds that are perfect for the disco. If you're an AD fan, this is £100 well spent.